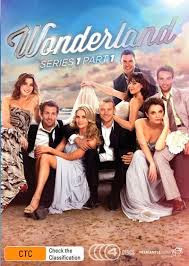 Did you love the original Australian series which screened on Channel Ten earlier this year called 'Wonderland'? Well, now is your chance to watch it all over again or immerse yourself in it for the first time. Starring Michael Dorman (The Secret Life Of Us), Brooke Satchewell (Packed To The Rafters), Jessica Tovey (Mr & Mrs Murder) and Emma Lung (Entourage). Michael Dorman, Brooke Satchwell, Jessica Tovey, Tim Ross, Emma Lung, Ben Mingay, Glenn McMillan and Anna Bamford, this engaging relationship drama revolved around four couples at very different stages of life: the star-crossed singles, the blissful newlyweds, the hot new lovers and the long-term married couple - all set against one of Australia’s most beautiful beaches. WONDERLAND SERIES 1 PART 1 is available now on DVD. - Email me at josiegags@optusnet.com.au with your address (even if you have entered Josie's Juice comps before).